On Saturday, May 21st 2016 between 11 AM and 2 PM, the American International School of Bucharest (AISB) community will organize The International Festival in the campus located in Pipera Boulevard no. 196. Over 20 nationalities from the 56 represented in the AISB community will treat their guests to traditional food and drinks and will engage children and adults in games and contests that will teach them interesting things about their country, will spend few hours in a land of joy and friendship. Each year, over 1.000 guests attend this festival, already a tradition in our school. AISB community members, their families and friends from various countries worldwide, arrive on the AISB campus to celebrate diversity, internationalism, to teach others and to enjoy giving to others. Every community gets together to offer a unique experience both to the students and their parents. This year, the Romanian community will treat everyone present to traditional delicacies, like mici, sarmale with polenta, eggplant salad and tasteful sortiments of cheeses. All the funds that will be raised at the event will be donated to support bringing back home the famous work of art of the Romanian sculptor Constantin Brancusi, entitled „The Wisdom of the Earth”. 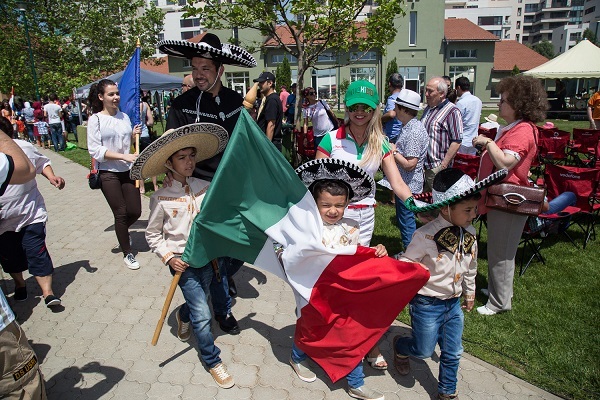 „We will be enjoying, as we do every year, a flag parade and a fashion show where we will be able to see the national costumes and learn the wondeful stories that make them so special. AISB students will perfom in a music and dance show, where they will mesmerize our guests with their finest talents. Every year, The International Festival is the embodiment of the International Baccalaureate Program`s profile based on which we educate our students – internationally minded global citizens,” Dr. Robert Brindley, Director AISB. „The International Festival is a moment of pride and joy for the entire parent, teacher and student community of AISB. We plan many weeks in advance and we organize ourselves as best as we can in order that the representatives of each community to feel welcomed and embraced in this fine oassis that AISB is. During this year’s International Festival we will welcome special guests from Romanian schools, Scherezade Foundation, Hospice Foundation, Amnesty International and Inocenti Foundation. Among the guests, we will also welcome a few refugees with their families. We look forward to having them on our campus and they will be welcomed with open hearts and with great pleasure”, stated Sorina Muresan Tulea, President of the AISB Parent Teacher Organization.